Remember back when Google searches were just a bunch of text links? Yeah, well me neither, but from what I can recall it wasn't as clean and user-friendly as the Google we have today. The website had come a long way since its inception and even since 2002 when it looked something like this. A 2002 Google Search Results Page, ouch! As Google began to improve its search relevancy, it also began to introduce rich media results via schema markups. One of the first and arguably the most popular schema mark up has been the ratings, reviews and comment mark up. Its gone through several changes over the years and in 2018 Google looks set to add to it once again. Rating schema has become a staple for many search results such as product reviews, recipes, tours and even businesses overall service. Rating schema can be pulled by Google's Google my business platform, via 3rd party rating providers like Facebook, Zamoto or Yelp and finally from your sites schema. What is a rating schema? Rating schema allows you to mark up certain elements on your page and have it pulled through to the search results page. The rating schema is made up of 3 elements. Studies have shown that having marked up ratings in SERP dramatically improves click through as well as time on site once a user does click through. Schema allows you to differentiate yourself In a space where every little bit counts. Being the only listing with a rating or being the one with the highest number of submissions can be the decider in you getting the user to click on your listing as opposed to another. Google knows exactly how valuable the above the fold real estate is and is continuously looking at ways to push down organic listings with instant answers and encourage brands to use paid search to improve click through and impression share. It's a smart move on their part and ensures that "position zero" as we call it in SEO land, becomes a more coveted spot. A recent A/B test was spotted by Berian Reed and posted on Twitter on Twitter which shows Google adding a new position zero featured snippet that groups together listings with ratings in a grid above the fold. 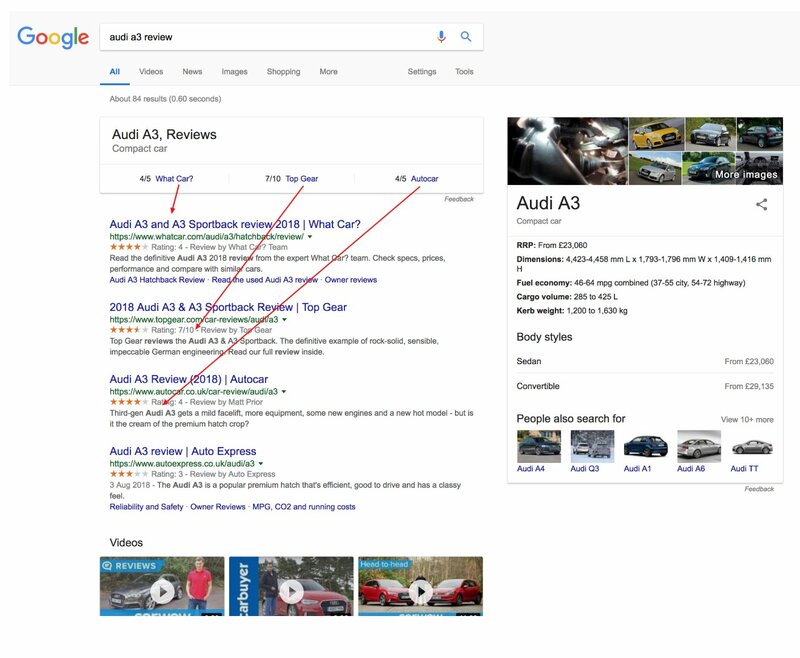 In the example of car reviews, Google has picked up snippets from three different sites with some useful information. You can see how Google is pulling snippets from each site to construct a short snippet at the top. At this point, there has been no formal communication from Google or any news from SEOs about this new feature. We do not know how many ratings Google is willing to pull to the top or for which products they'll roll it out for. I suspect popular categories like products, restaurants and movies will be the first to see this rolled out to search should Google decide to make it a staple feature. Search Engines have been serious about pushing the use of Schema lately, and even if you do not see the markups just yet, I would highly recommend you start using the relevant schema for your site. While it may be a pain to set up your schema and have it rolled out across your site, it will put you in a strategic advantage in SERP. Search engines are moving towards having a bias for marked up results so why not make sure you have them ready.